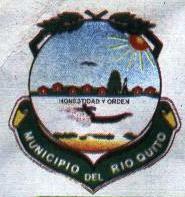 Río Quito is a municipality in the Chocó Department. It was established on 25 April 1999. 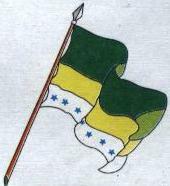 Río Quito flag is horizontal green-yellow-white with inner ratio of 2:1:1. The white stripe is charged with blue stars. From the image, it is not clear how many stars are there, but calculated guess is that there are eight stars for the eight "corregimiento" of this municipality.